With the release of the iPhone 3G and the App Store, iPhone software was all the rage when it came to Apple’s mobile devices in 2008. Yet, the companies who’ve populated the iPod ecosystem with speakers, headphones, cases, and other accessories continued to produce fine accessories all year long. A number of those accessories, both for Apple’s iPod line and the iPhone, caught our eye. In the grand tradition of our Plays of the Year, we’d like to recognize a few of our favorite iPod add-ons. Here are 11 accessories that made the grade this year. Etymotic is a pioneer in hearing-device microphones and its $299 ER-4P in-ear-canal headphones have long been a favorite among headphone-loving audiophiles. The company combined these assets to create the HF2 Headset + Earphones ( ), which is essentially a set of the ER-4P with an inline microphone and an iPhone controller—at a little more than half the price. The HF2’s true canalphone design blocks more external noise than any other iPhone headset we’ve tested, and the sound quality and microphone performance are head-and-shoulders better. Oh, and they work with your iPod as well. Most iPod alarm clocks are awash with buttons and switches—the last thing you want to encounter when waking from a deep slumber. Boston Acoustics’ Duo-i ( ) is Apple-like in its simplicity: despite an impressive list of features, most of the Duo-i’s functionality is accessible via two buttons and three knobs. The Duo-i also sounds great and includes an AM/FM radio, auto-dimming display, video output, two additional audio inputs, and a wireless remote. Optional $15 grilles, available in nine colors, let you customize the Duo-i’s look. 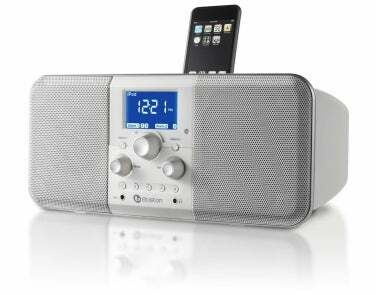 And about that groggy thing: you can snooze the alarm by tapping anywhere on the wraparound, touch-sensitive trim. If you’ve got only a single iPhone or iPod, the PowerDock looks like the sort of crazy product you’d see on a late-night infomercial. But if you’ve got multiple Apple i-devices—as many people do these days—you’re probably wondering why no one thought of this before: a dock that holds multiple iPods. Although it doesn’t let you sync with iTunes, the PowerDock simultaneously charges up to four iPods and iPhones—via four Universal-style dock cradles—from a single power cable, eliminating the frequent plugging and unplugging of dock-connector cables and the accompanying desktop clutter. 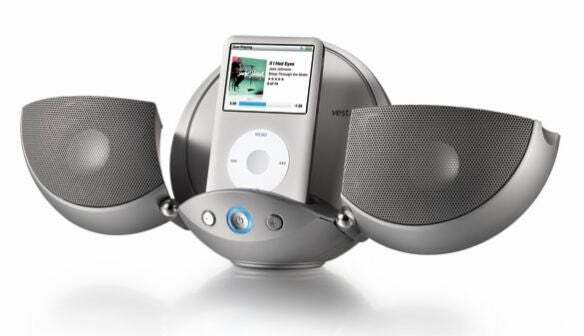 And even with four iPhones or iPod classics docked, the PowerDock’s weighted base keeps it stable. Someone at Griffin Technology really wants to reduce desktop clutter. The Simplifi combines an Apple-matching brushed-aluminum-and-white iPod dock with a universal memory-card reader and a two-port USB hub. 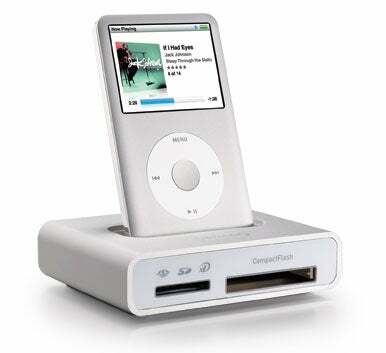 The card reader supports CompactFlash, SD, SDHC, xD, and Memory Stick and Memory Stick Pro cards, and the dock cradle uses Apple’s Universal design to support all but the oldest dockable iPods (a set of six dock inserts is included). The USB hub works in either unpowered or, using the included AC adapter, powered mode. 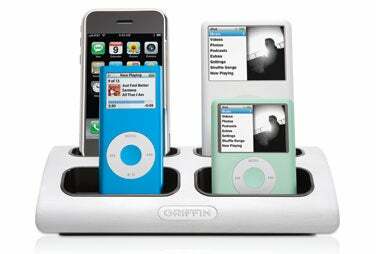 Many computer speakers lack a dock for your iPod, but few iPod-specific speakers are designed with computer use in mind. Similarly, many speakers that sound great from across a room sound mediocre when used up close (and vice versa). 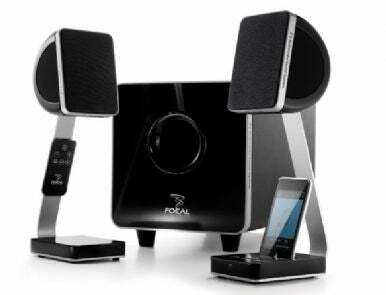 The simple, iMac-like appearance of Focal-JMlab’s XS belies its versatility. The system includes a Universal-style iPod dock as well as USB and analog audio inputs[CB18], and it sounds great whether you’re 2 feet away or 15. (A wireless remote comes in handy for the latter.) The two-way satellites, based on the company’s Solo 6 Pro monitors, are powered by dual 30-watt amps, and the 70-watt subwoofer includes a USB sound card for converting your Mac’s digital audio signal to analog. We see lots of unique iPod speakers, but many are cheap attempts to make a buck. The Ladybug is an exception. This portable speaker system, which runs off battery or AC power, packs an impressive punch inside a compact—and cute—package that just so happens to look like a Coccinellidae. It spreads its speaker-laden wings to expose a Universal-design iPod dock (and to increase stereo separation); a digital amp and rear-mounted woofer provide more oomph than you’d expect. A wireless remote with menu control, auxiliary audio input, audio/video output, and a USB port for iTunes syncing round out the package. 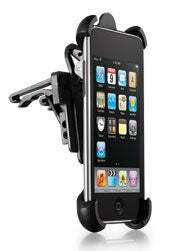 An accessory that surprises with its versatility, the VentMount is popular among Macworld editors for providing an inexpensive and functional—but removable—car mount for your iPhone or iPod touch. The VentMount’s clip attaches to your car’s AC vent, and your player easily attaches to the mount, leaving all controls and connections accessible. (The only drawback is that the VentMount doesn’t pivot to either side.) When you reach your destination, the mount pops off the clip and functions as a belt clip. But there’s more: that belt clip also doubles as a hands-free stand for watching video. An add-on battery comes in handy when the battery for your iPhone or iPod won’t last through the end of the trip. 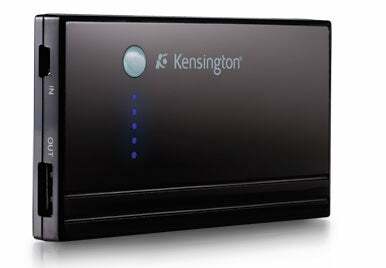 Although we like the convenience of those that connect directly to the dock-connector port on Apple’s devices, Kensington’s thin-and-flat Battery Pack and Charger offers far longer battery life—up to 100 hours of music playback or 21 hours of video watching. And because it gets and provides power via a standard USB port, you can charge it from your laptop, and you can use it to power many more mobile devices than just Apple’s gadgets. If you still listen to radio, iTunes Tagging is a compelling feature. If you’ve got an iPod speaker system with HD Radio and iTunes tagging, a touch of a big Tag button lets you mark songs you like as you hear them on the radio and then uses your iPod to transfer that information to iTunes, where they show up in a special Tagged playlist. You can then purchase those songs—assuming that they’re available in the iTunes store—with a click. The trick is finding systems with iTunes Tagging; there are currently only a handful on the market. 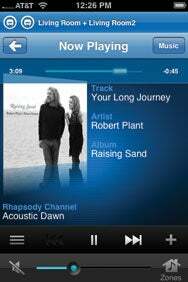 For years, one of the biggest challenges for iPod owners has been how to get their iPods to play through their car stereos without messy cables or frustrating FM-transmitter settings. With the CA-IP500, Fusion finally provides something we’ve long been asking for: a car stereo with a built-in iPod dock slot. You just flip down the head unit’s front panel and then slide your iPod into the slot; dockable iPods from the second-generation iPod nano to the newest iPod touch (but not the iPhone) are supported via custom “sleeves.” Rotary controls and an iPod-like menu system on the stereo’s face let you control your playback right from the head unit. With its wireless ZonePlayer wireless receivers, the Sonos Multi-Room Music System is a wonderful way to pipe music throughout your home. Yet its controller is bulky by today’s standards and, at $400, a little pricey. Those iPhone or iPod touch owners interested in possessing a Sonos system can now knock $400 off the price tag thanks to the free Sonos Controller for iPhone. It not only mirrors the functionality of the hardware controller, but thanks to touchscreen control, it’s easier to navigate. Senior editor Christopher Breen contributed to this article.